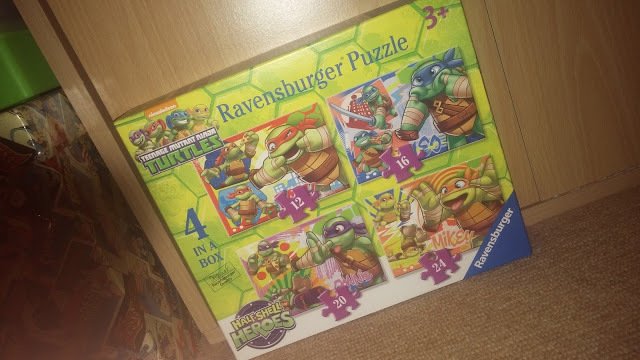 Where Roots And Wings Entwine: TMNT Half Shell Heroes 4 in a box puzzle set by Ravensburger Puzzle - review. 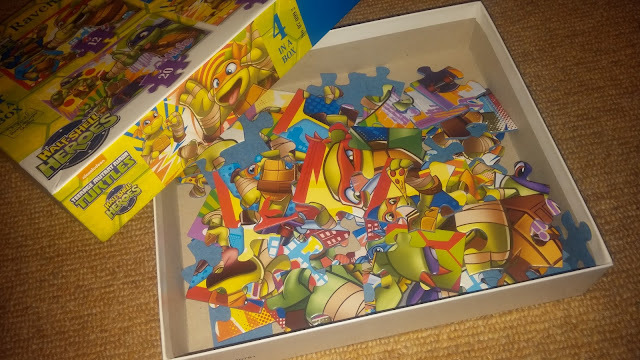 TMNT Half Shell Heroes 4 in a box puzzle set by Ravensburger Puzzle - review. 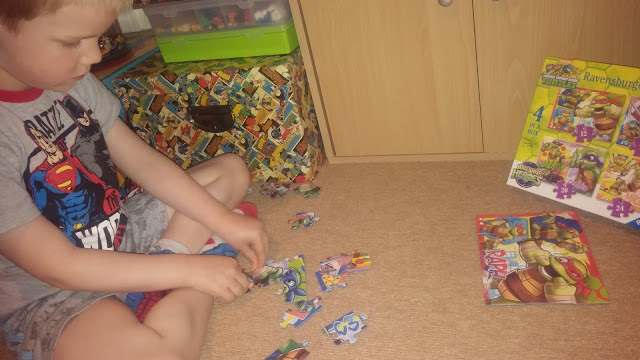 As Bug loves puzzles and is a huge fan of the Teenage Mutant Ninja Turtles he was delighted to turn his hand to the TMNT Half Shell Heroes 4 in a box puzzle set by Ravensburger Puzzle. Aimed at little ones from 3 years+ the puzzle set consists of 4 puzzles approximately 19cm x 14cm. The puzzles vary in difficulty with each puzzle being made up of puzzle pieces of different sizes and numbers. The puzzle with the largest sized pieces consists of 12 pieces, with the other puzzles being made up of 16, 20 and 24 pieces. 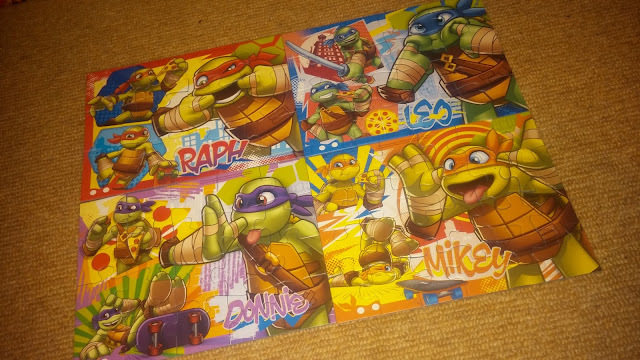 Each puzzle is adorned with a TMNT character, with the pieces being colourfully illustrated to create a vivid picture showing Raph, Leo, Donnie, and Mikey. The puzzle pieces are well made, durable and true to Ravensburger Puzzle's high quality. 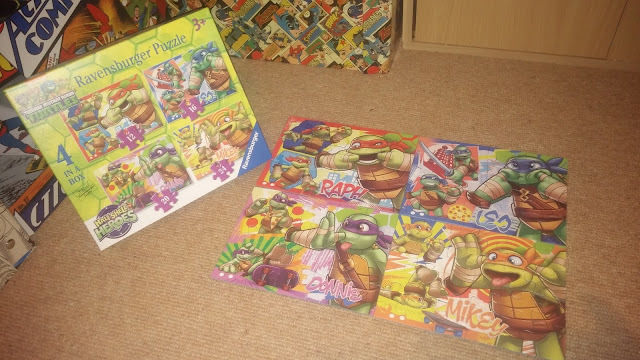 Bug loves the puzzle set, being especially fond of the colourful designs and the TMNT pulling funny faces! 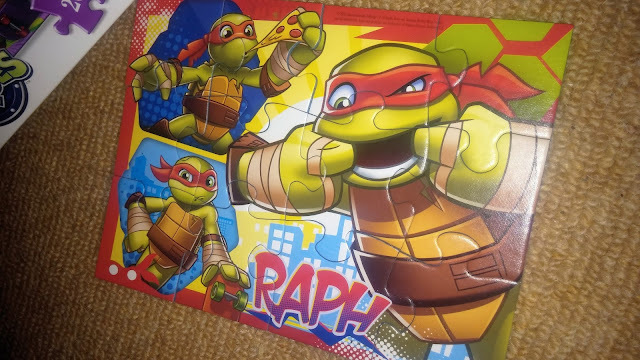 Whilst Bug finds the puzzles easy to complete compared to the larger and more complex puzzles he has previously mastered, he loves putting the puzzles together to see his beloved TMNT characters especially his favourite Raph. 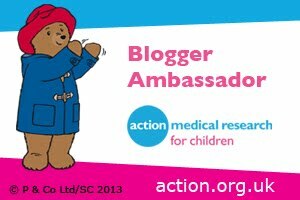 I have also noticed that the puzzles are a great way for to take five minutes, relax and calm down after vigorous play, watching TV or a hard day of learning at school. The TMNT Half Shell Heroes 4 in a box puzzle set has taken pride of place in his puzzle collection and will be enjoyed for a long time to come. 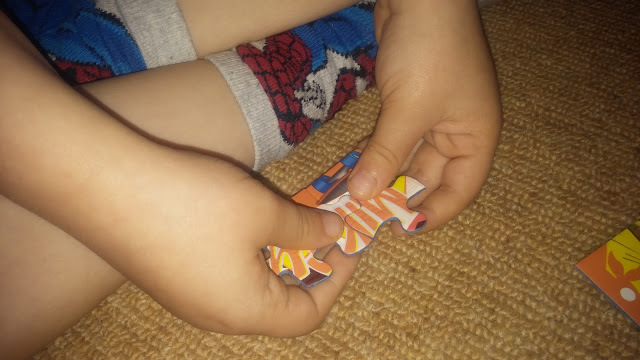 Perfect for fans of TMNT Half Shell Heroes and a great way to introduce puzzles to little ones so they can benefit from the joy of puzzles such as developing hand eye co-ordination, improving thinking skills and fine tuning concentration. I mean my son would love this!! OK ME!! I love Raph, what can I say!